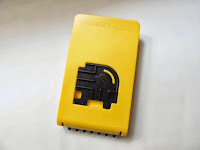 There are three major brands when it comes to the range of logic puzzles and games. ThinkFun might be the most popular one, but Smart Games and Popular Playthings make great games as well. 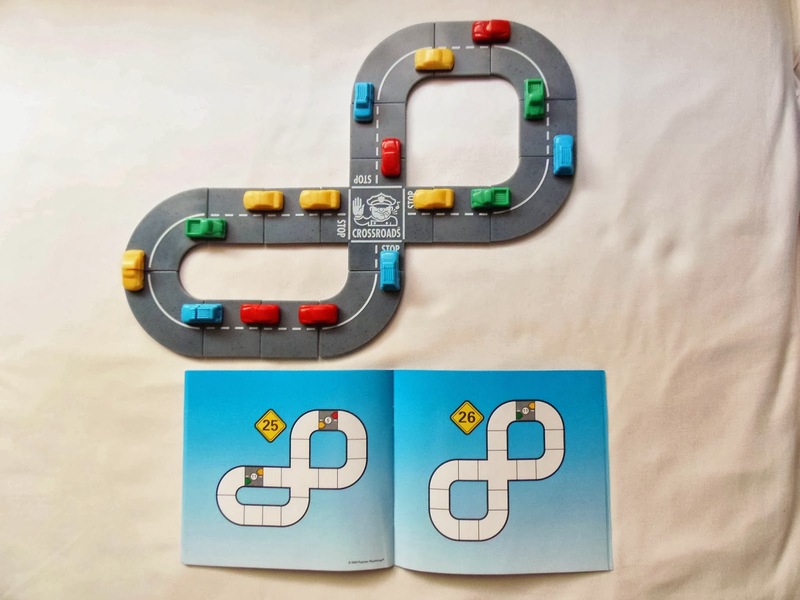 I have reviewed many of these games before, but it's the first time I'm writing about a Popular Playthings' game (except for Orbo). This nice game is called Crossroads and it's an adaptation of the classic edge-matching puzzle. The new version was made by a team of three talented people, with the concept and design by Bill Hanlon and Steve Wagner, and the computer analysis for the challenges made by R. Aubrey Hearn. The result is a highly addictive 30-challenge game like few can achieve. 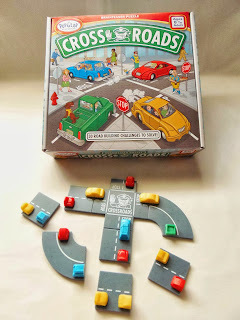 The Crossroads game is comprised of 24 pieces divided in three main categories: curved, square and the unique crossroad piece. 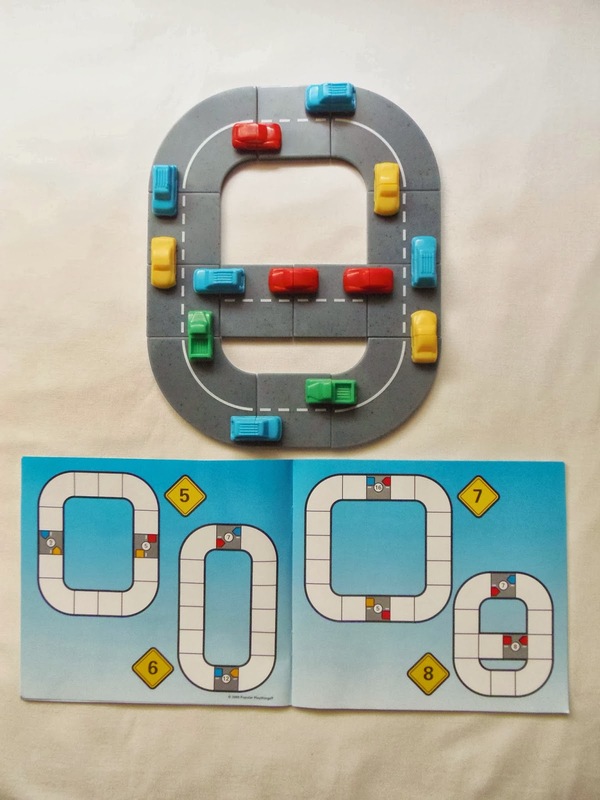 Each piece features halves of colored vehicles, but within each category, except for the crossroad piece, the layout of the vehicles can vary. 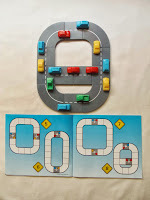 The object is to choose a road layout from the challenge booklet and solve it so the halves and colors of the vehicles match with one another. The vehicles are also divided by categories depending on their colors: sedans are yellow, red is for coupe, blue for SUV's and finally, green for the pickups. 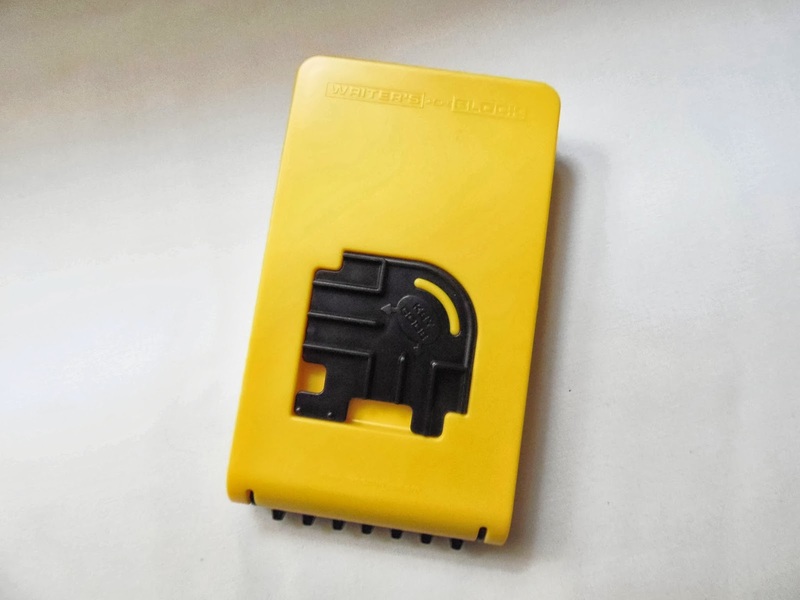 You need to make sure each vehicle front is being connected to its corresponding rear, because it's possible to have two fronts connected or vice-versa. The challenges vary in difficulty, although they are not divided in sections like other games of this type. The first ones start with 8-12 pieces and usually show two starter pieces already in place to help you. As you advance, you'll see more and more pieces added to the layouts and most of them only show one starter piece. The last challenge doesn't even show you any starter pieces, only the layout. As for difficulty, and like any good edge-matching puzzle, it can become rather challenging as you progress. It took me a good 15-20 minutes to solve each of the last ones. If you get to the last couple of pieces and they don't match, it's a nightmare to know which piece to swap. As you build one of the layouts you'll encounter often times more than one piece that can be correctly placed, but further along the way you'll end up in a dead-end. To make the challenges easier, you can just build the layouts without taking into account the starter pieces. This way, any of the challenges can have multiple solutions, whereas if you go for the suggested starter pieces there's only one possible solution. The Crossroads game is easily my favorite from Popular Playthings. The replay value is huge, since each of the 29 layouts can have up to hundreds of challenges (the last one has a unique solution). 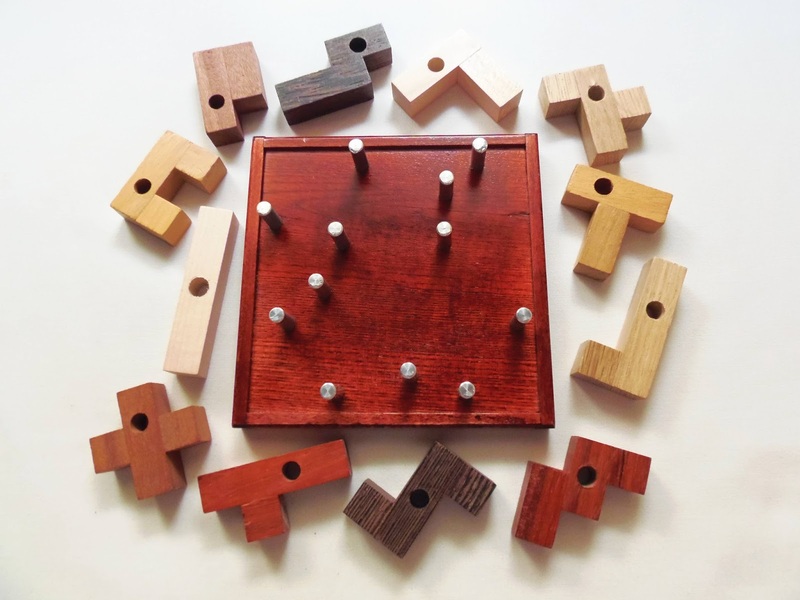 If you like challenging edge-matching puzzles, this one is a must-have for you. Availability: You can buy the Crossroads puzzle at Sloyd.fi for about €20. 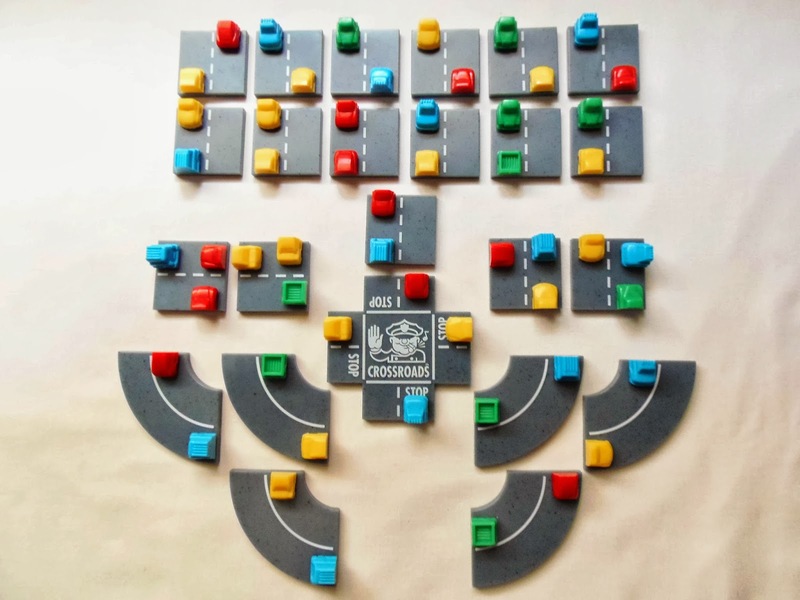 Robrecht Louage has accustomed us to his ingenious coin puzzle designs over the last few years, and this year's 33rd IPP Design Competition was no different. 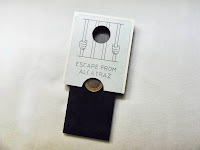 The latest addition to the family is the Escape From Alcatraz puzzle, a secret opening box with a hidden maze. The design itself is one of the best from Robrecht. He used the back of a Belgium €1 coin, featuring King Albert II, and designed the puzzle around it, as if to imprison the King behind bars. Your task is to navigate the hidden maze and free the King from Alcatraz. The puzzle is made from fiberboard and is a bit smaller than its predecessors, measuring 9cm x 7.5cm (3.5" x 3"). 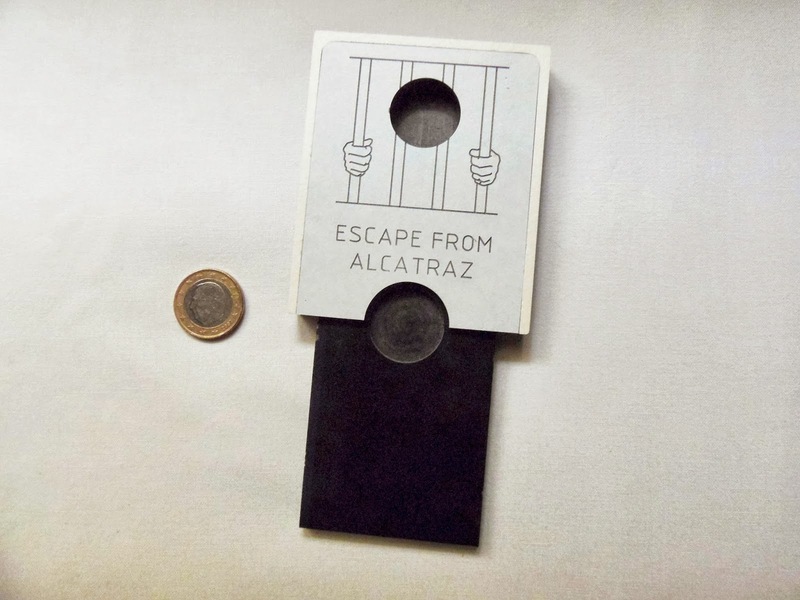 The concept can be compared to Rebrecht's Remove the Yolk, which featured a hidden maze as well, but even if you know all its steps by heart it won't be of much help for you to Escape From Alcatraz. The main reason is obvious, the two internal mazes are completely different. But how different, you ask? - It's hard to say, really. The only way you know they're different is by the moves you do with each other. 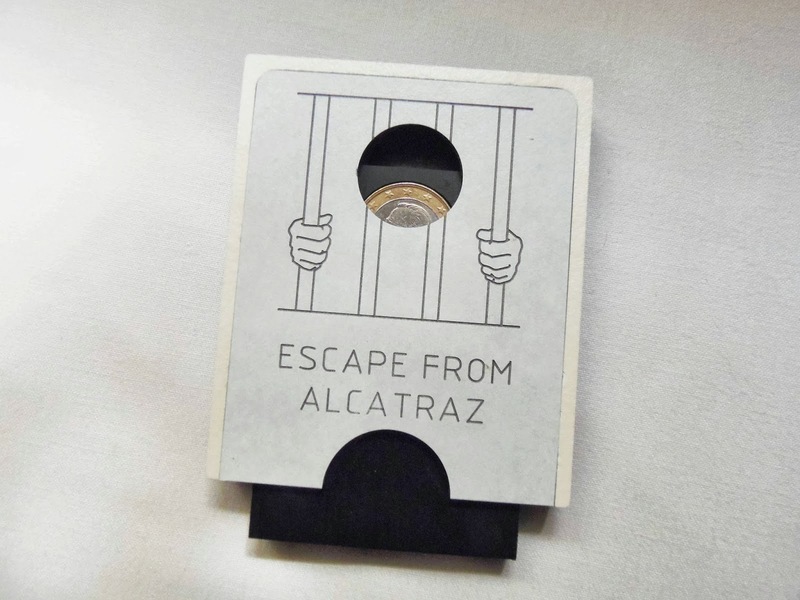 From my experience with the two puzzles, I'd say the Yolk puzzle is a little harder than the Alcatraz, probably because the maze has a few more moves to free the coin, or just because I got better since then. 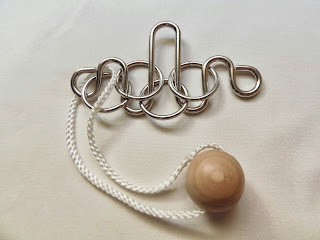 Looking at the description of the puzzle at IPP's website I discovered that one of the materials used, besides fiberboard and steel balls, is a magnet. I only knew about this after I had solved it, so I was a bit surprised, because I would've never figure out a magnet was present. Maybe that explains why it's so tricky to navigate the maze, since you never know exactly where the steel balls - or just ball - are. The magnet may be preventing the balls from moving freely. The first time I tried to Escape From Alcatraz it took me about 15 minutes. 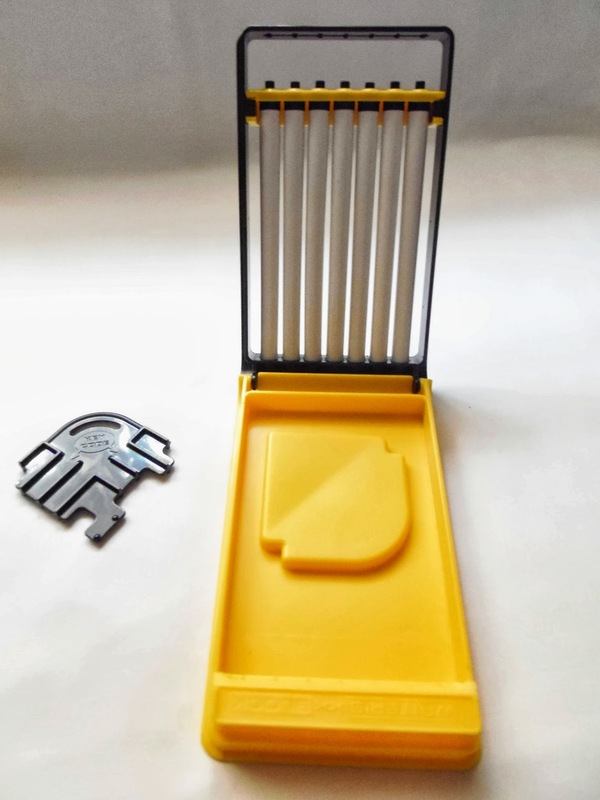 The platform that holds the coin has about 5 steps. 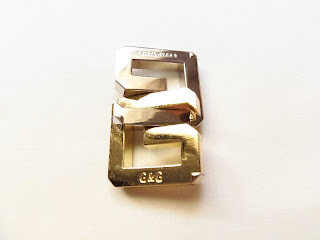 In other words, it will slide off the frame in 5 different stages, with the coin being closer to the exit point with every step - An alternative name could be "5 Steps Invisible Lock". 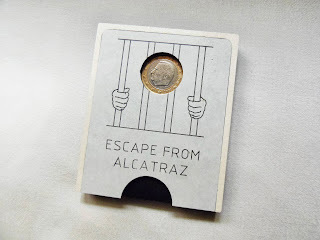 Strangely, it took me much less time to get the coin back at the starting position - about a minute or two. I was expecting it to be equally challenging, but I was glad it didn't. After several successful solves I can now solve it in just a few seconds. I think I pretty much learned all the basic moves, but I'm still not certain what exactly is going on inside that mechanism. I think it's just part of the fun in solving it. Escape From Alcatraz is yet another brilliant puzzle from Robrecht Louage. It may not have won an award at this year's IPP, but the design alone is deserving of recognition. The best part about it is that it keeps you guessing and analyzing it in further detail. It may be a while before you can figure out its mechanism completely. I can't wait to find out what Robrecht has in store for us next year. 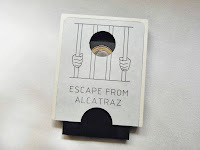 Availability: To order a copy of Escape From Alcatraz, you can contact Robrecht directly. Oskar van Deventer's Writer's Block has been on my wishlist for as long as I've been collecting puzzles - That's over five years now. 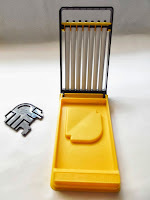 The reason it took me so long to get it was because of its packaging, which is very bulky for its size and would always steal precious space for other puzzles (see the package here). You all know how postal services are with box restrictions. The puzzle is manufactured by Recent Toys, and it's probably the company with the worst packaging design out there. All of their puzzles are packaged in giant boxes, which not only are hard to open, but it's basically a waste of materials. Long story short, I had to ask for the package to be taken out and only the puzzle itself be sent. The name of the puzzle is quite interesting, and for those of you who don't know, the term refers to when an author is unable to write new material (explained better here). The puzzle is very unique and like nothing I've ever seen. Only the genius of Oskar could create such an amazing concept. 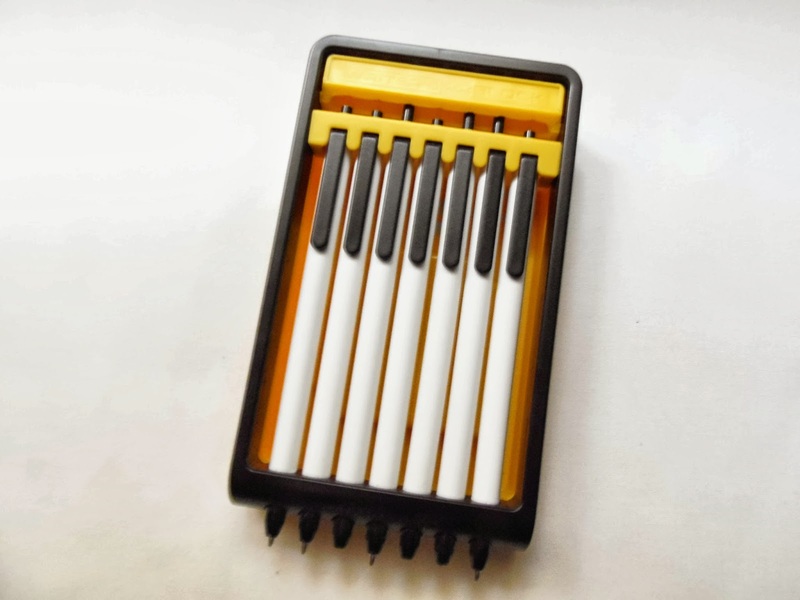 It consists of seven pens that keep the mechanism locked with their buttons, and with the help of a key, inserted at the top, you will be able to open it, sort of like the movement you do to flip a notebook's page. The mechanism is easier to explain if you think about the Lights Out puzzle. Anyone should remember this classic. The pens have only two states, on or off, but the tricky part is that the key is only able to turn on some of the pens at the same time, while turning off others in the process. The goal is to find the correct sequence of movements necessary to get all the pens with the same state - On. The key itself is quite unusual. 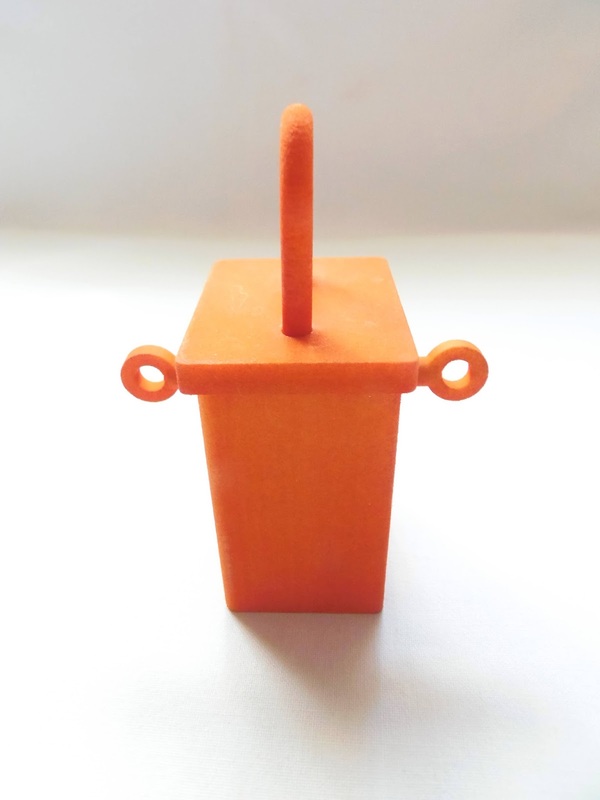 You can turn it and flip it over in eight different ways to produce different results. 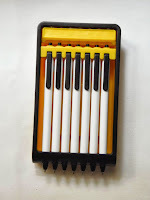 The pens can also show 128 different positions and you can solve it in only four moves. Numbers courtesy of Jaap's Puzzle Page. The difficulty depends on the number of moves it takes you to open it. You should be able to eventually open it by trial and error, but that wouldn't be no fun. This is considered a difficulty level 7/10 and I sort of agree. The puzzle can be solved within a minute the first time, or it could take more than 10 minutes. I don't think it should be more than that, even for a beginner, because of the number of pens and ultimately, the number of possible moves. I solved it in a couple of minutes the first time, but curiously enough, it took me twice as much to get all pens in the off position. The challenge is basically the same, except in reverse. I still don't have a flawless system to solve it, so my times are always varying. Still, it's rather fun to solve it multiple times. I waited so long to get this puzzle that I was afraid my expectations wouldn't be met and I would be disappointed with it. That feeling was quickly overcome the first time I tried it. The concept and design are so original that it will be a while before you're bored with it. I strongly recommend it to any puzzler out there. Oskar never disappoints. 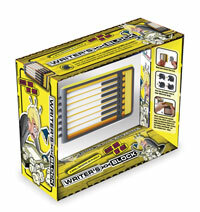 Availability: I got my Writer's Block at PuzzleMaster, but it's currently out of stock. Just keep checking their site, because it should be restocked soon. You can check other puzzles by Oskar here. The Spider wire puzzle, also known as The Black Widow, is a perfect example of how a puzzle can look really intimidating, when in reality it's not that difficult. The puzzle came from Sloyd in Finland and is manufactured from 3mm nickel plated wire. These puzzles have a smoother surface than the Tavern puzzles, for example, and are easier to manipulate. The goal is very simple to understand, and yet can be rather challenging if you're not an experienced puzzler. You just need to remove the string and bead from the wire frame, and afterwards return it to its starting position. You need to fully understand the solving process to be able to get the string back in the frame. I'm not a big fan of wire puzzles, and the ones that have strings are even scarier. If you're not careful with these, they tend to form knots very quickly and disentangling them can be quite a nightmare. Fortunately, this puzzle was rated as a level 1/5, so I wasn't very intimidated by it. Oddly enough, I saw another version of this puzzle at PuzzleMaster, but with a difficulty level of 9/10. I was very confused by the extreme ratings, so I proceeded with caution as I was attempting to solve it. To my surprise, I was able to solve it within 10 minutes, so the 1/5 rating is more accurate, although a 2/5 would be more fitting. This got me thinking why it would even be considered a 9/10 puzzle, but I actually understand why. To a beginner, it can be really challenging, because the solution involves a set of sequential steps that may not be as straightforward as you'd might think. There are four rings and to solve it you need to use all of them. This is highly dependent on how you look at this type of puzzles, but I don't consider it as easy as Sloyd's rating and definitely not as difficult as PuzzleMaster's. If you have this puzzle, let me know what'd you think of its difficulty. The Spider was a pleasant surprise, because I usually fear string puzzles like the plague. It felt nice to solve it quickly for a change. Usually it takes me days to figure them out, when not weeks... I would definitely recommend this one for beginners, as it will provide a steeper challenge than the easier ones and prepare you for the tougher levels. Availability: You can find The Spider wire puzzle at Sloyd.fi for just about €6. 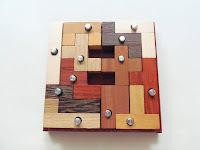 Anyone that reads my blog frequently knows that I'm a big fan of Jean Claude Constantin's puzzles. However, he now has some competition for the title of prettiest puzzles, also from a manufacturer in Germany, called Siebenstein-Spiele. There's actually a lot of great puzzles coming from there recently. 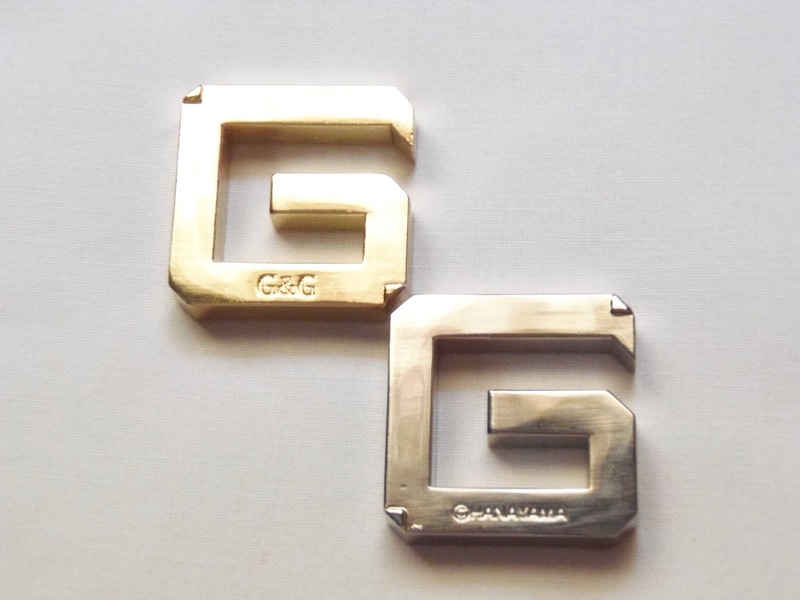 The latest addition to my collection is Galileo, designed by Jürgen Reiche. It's a small packing puzzle with only five pieces, but quite demanding. The design of the puzzle is reminiscent to some of Constantin's best works, using different types of wood and adding subtle but perfect finishing touches to the overall appearance. The frame is slightly concave in its edges and is decorated with small rhombi. A sheet of acrylic completes the frame and actually adds a degree of difficulty by limiting the way you place the pieces in the puzzle. This is a small puzzle compared with regular sized packing puzzles, with a diameter of 8cm (3.2"). The pieces feel small, but it's quite easy to handle them. 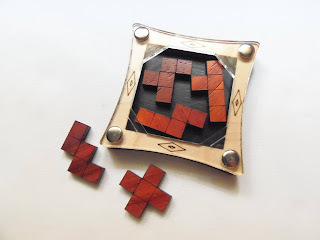 With only five pentomino pieces, you might expect this to be an easy puzzle when, in fact, it's actually pretty tricky - level 8/10. The reason for this is the odd area of the inner frame, which doesn't match the length of the pieces. It's slightly smaller than six units and the total area is larger than the total of the pieces'. The result is empty spaces when all the pieces are packed, and how the pieces are actually arranged is the key to solve it. Since packing puzzles are my favorite kind of puzzles, it didn't take me long to figure it out. Because the pieces don't fit naturally on the squared frame, the alternative is kind of intuitive. After you discover how to pack the pieces, it's only a matter of time until you find the correct arrangement. 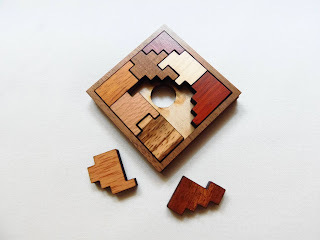 I'm not sure if there's multiple solutions for the puzzle, but with the pentomino nature of the pieces I would assume it has at least a few more, excluding rotations. 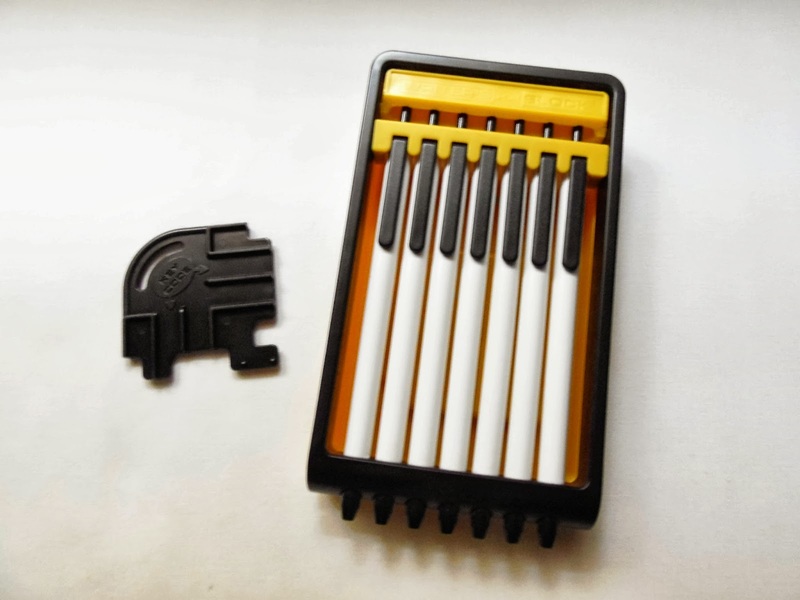 Keep in mind that you can only use the top side of the pieces for the correct solution, because the backside doesn't have the markings that indicate the square units. This constraint also makes the puzzle even harder, but ultimately more rewarding. Availability: You can get the Galileo puzzle at PuzzleMaster for $15 CAD. Click here for more Siebenstein-Spiele puzzles. Back in January of this year, I reviewed the first creation of aspiring puzzle designer Splinter Spierenburgh, the MazeRoll, and was very impressed by the overall quality and design of the puzzle. The concept was highly original and had the bonus of having hundreds of different mazes to solve. It was also entered in this year's IPP Design Competition, and while it didn't receive any awards, it was still a breath of fresh air for the puzzle community, to see new concepts like these getting the attention they deserve. For the obvious reasons stated above, I was rather excited when I received my second puzzle from Splinter, the Burgh Lock, after months of tease by pictures only. 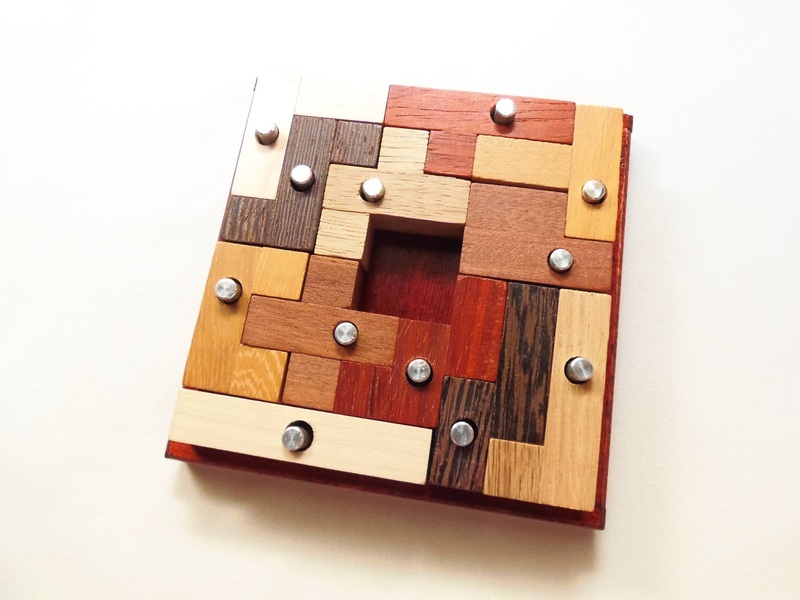 Would this new puzzle be able to surpass its predecessor? Would it be easier or harder to solve? I had all these kinds of questions, and being a big fan of Trick Locks, with seven of them already reviewed here on my blog, you can easily understand my enthusiasm. Just like the MazeRoll, the Burgh Lock is 3D-printed from Shapeways in nylon plastic and dyed and assembled at MFAVE. The surface is rugged, and with continued use the orange color might wear off a little. It's slightly bigger than the locks I've tried so far, but not by much, measuring about 9.5 x 4.3 x 3.3cm (3.7" x 1.7" x 1.3"). It also has a different shape from what I'm used to see in other similar puzzles, more bulkier. It's clearly a sign that there's many things happening inside that hidden mechanism, so don't expect to encounter an easy puzzle, on the contrary. There's also a few red-herrings along the way to make your task just a tad bit harder. The Burgh Lock has quite a few original characteristics that are new to me in this type of puzzles. For starters, how many Trick Locks do you know that come with two keys? No, not identical keys, distinct keys. And, if that wasn't enough already, you also have two keyholes slightly different from each other. One key for each keyhole... Seems logical, no? Well, not quite simple as black and white, but you'll understand once you finally solve it. To make things even more complex, one of the keyholes has a rotating disk, and both keyholes can be turned a good 80º in the same direction, at the same time. Too many things to worry about as you try to discover the secret to unlock the puzzle. 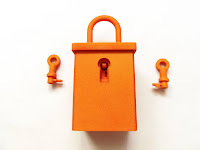 One of the things I was worried about, though, was how fragile the lock appeared. Every lock I have tried so far was made of metal, so there's not much you can do to easily break them. 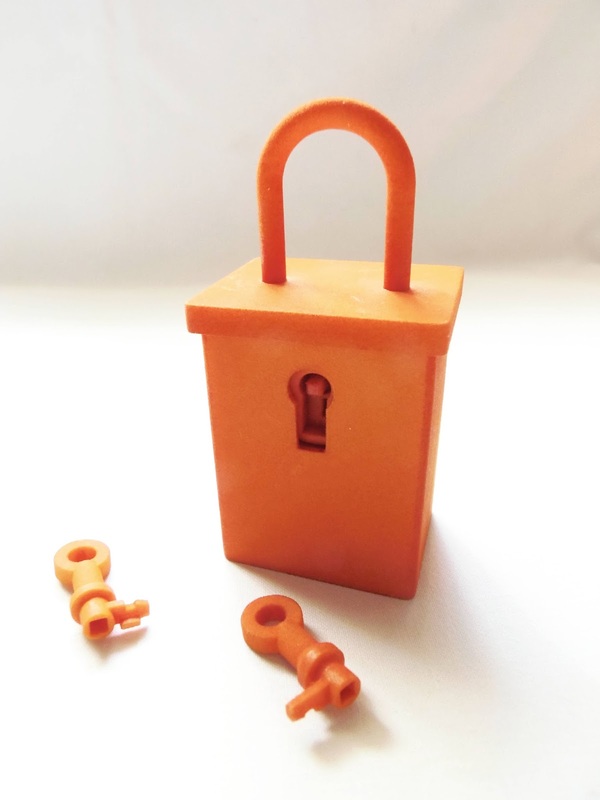 However, the fact that the Burgh Lock was made in plastic, had me worried thinking I was going to break something before I was even able to solve it. 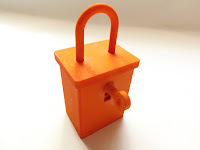 After treading carefully in the solving process for about half an hour, my mind was put at ease when I finally saw the mechanism and knew that that was nothing to be afraid of. Yes, you do need a little bit of pressure to open it, but nothing that will come close to breaking it. The solution to open the lock is in my opinion, a stroke of genius, and it will certainly break a smile on you. That a-ha moment is surely reward enough, but seeing how the mechanism works is mind-blowing. There are two solutions slightly different from each other, but both end up with the same effect. How you reach the solution is entirely up to you, but I would be curious to know which method you used to unlock yours. Your thoughts on the puzzle itself will also be important for the designer to further improve his creations. So, how does the Burgh Lock compare to the MazeRoll, the first design by Splinter? It's very hard to answer one or another, actually. I loved both, but they are two completely different puzzles and it would be unfair to choose one over the other. As far as difficulty goes, however, the Burgh Lock is definitely much harder and complex than the MazeRoll. If you crave for challenging puzzles, Splinter's Trick Lock is the way to go. 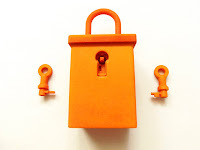 Now, I'm not an authority on Trick Locks to make a statement on whether the Burgh Lock is one of the best puzzles of this category out there, but I can say with the utmost certainty that it was the best Trick Lock I've had the pleasure to solve so far. If I had to recommend a Trick Lock, this one would be my top choice. If Splinter is this good with just his second design, I reckon we will be hearing a lot about him in the near future. I can't wait to see what he has in store for his next project. 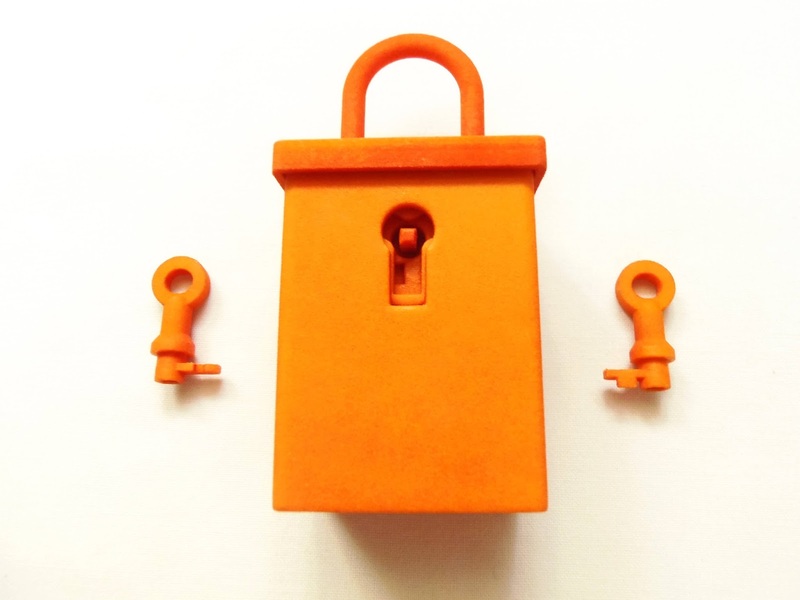 Availability: The Burgh Lock is available from MFAVE in The Netherlands for about €75. Your puzzle will arrive fully assembled and dyed, ready to be played. First, before talking about the concept, I'd like to mention the great craftsmanship that went into the design. There are five different types of wood, four in the pieces and the remaining one in the tray. The resulting visual effect is rather beautiful and elegant. The metal button in the square piece is the perfect touch on a flawless design, but also practical, since it makes it easier to move. 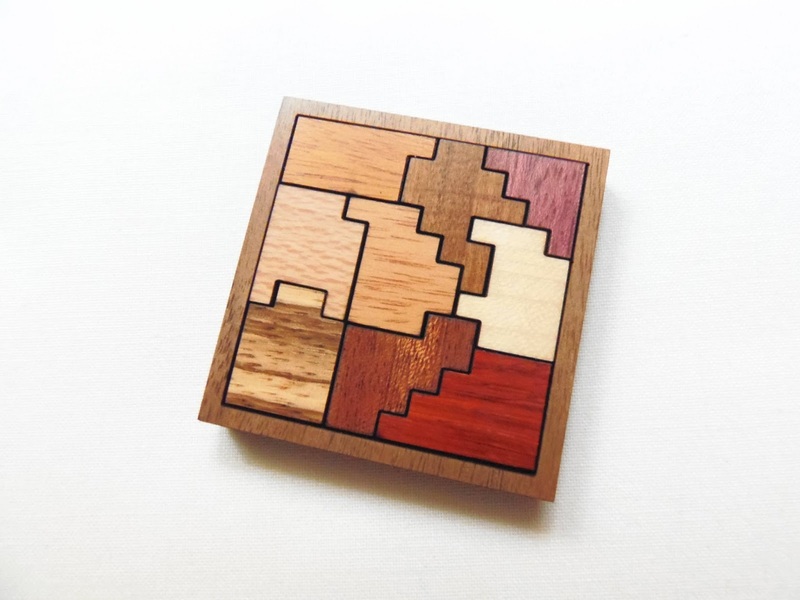 The size is average for a slide puzzle, with dimensions of 14 x 10cm (5.5" x 4"). 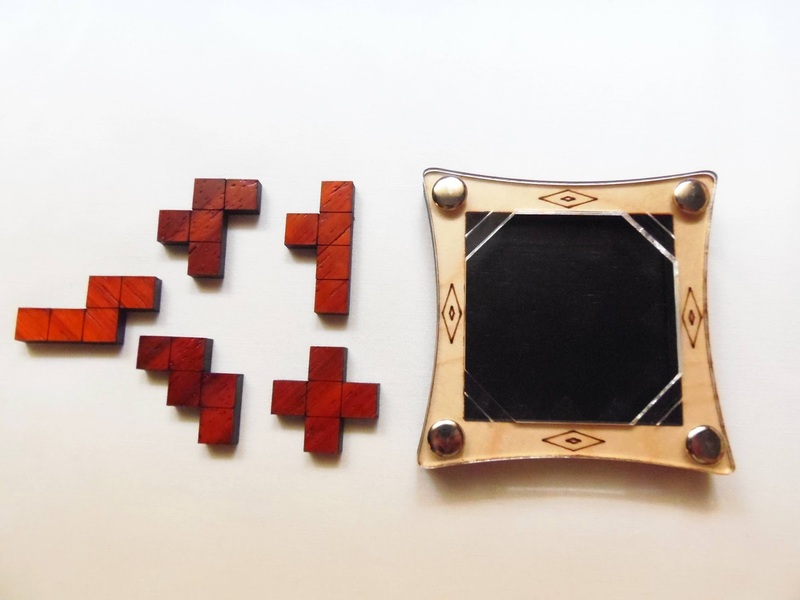 The puzzle consists of five pieces, four identical l-shaped ones and a square one. The starting position has the four identical pieces in a square form with each one occupying a corner and the square piece is in the middle below the two bottom pieces. The goal is to slide all pieces, without lifting a single one from the board, so that the square fits inside the empty space in between the four pieces. There are 22 possible moves for an optimal solution, but the important thing is to achieve the final state. With practice, you should be able to achieve the minimum step solution. There's something you need to take into account when attempting to solve the puzzle. The square is comprised of four different colors, each one corresponding to an l-shaped piece. When solved, each corner of the square should be touching an l-shaped piece of the same color. The puzzle would already be difficult enough if not for the colors, but instead it just makes it even more challenging. You'll be able to put the square inside the four identical pieces in a number of times on your way to the correct solution, but finding the right configuration is quite tricky. It took me about 10 or 15 minutes to completely solve the puzzle, and only after I've discovered that the pieces can be rotated inside, depending on the position of the other pieces. This interesting solving process was a first for me, and it gave me a great rewarding feeling and sense of accomplishment. I'm yet to find the optimal 22-step solution, though. 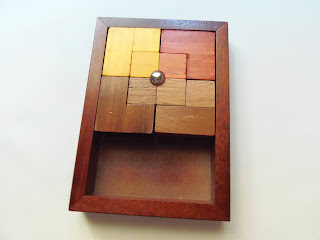 I'm a big fan of Grabarchuk puzzles, and with puzzles like the Sliding Stones who wouldn't be a fan? The high difficulty level might put some people off, but if you stick with it and insist this might not be the last Grabarchuk puzzle you'll own. Highly recommended. 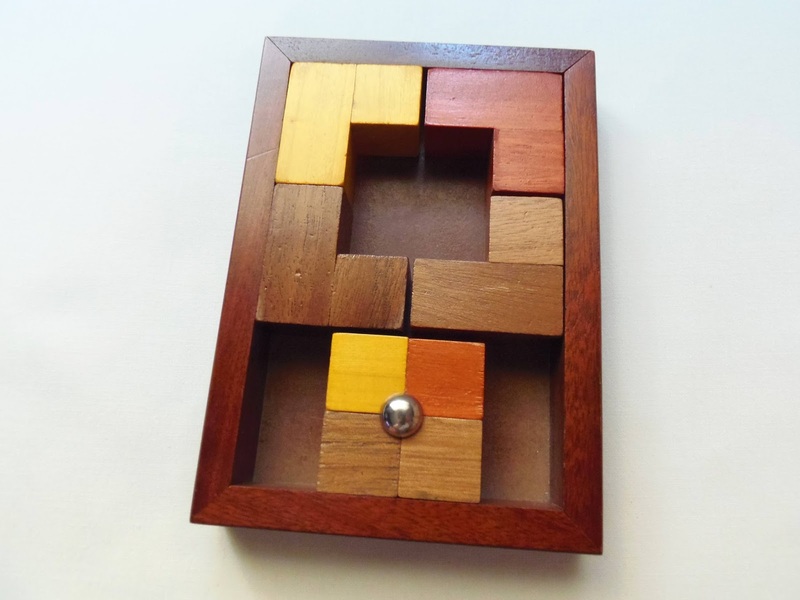 Availability: The Sliding Stones puzzle is available from Sloyd.fi for about €17. Jean Claude Constantin might as well be the king of packing puzzles. His designs and concepts are always much more than simple puzzles. He adds little ideas here and there that just makes for a perfect puzzle with an added difficulty, even if you knew the basics of that concept. 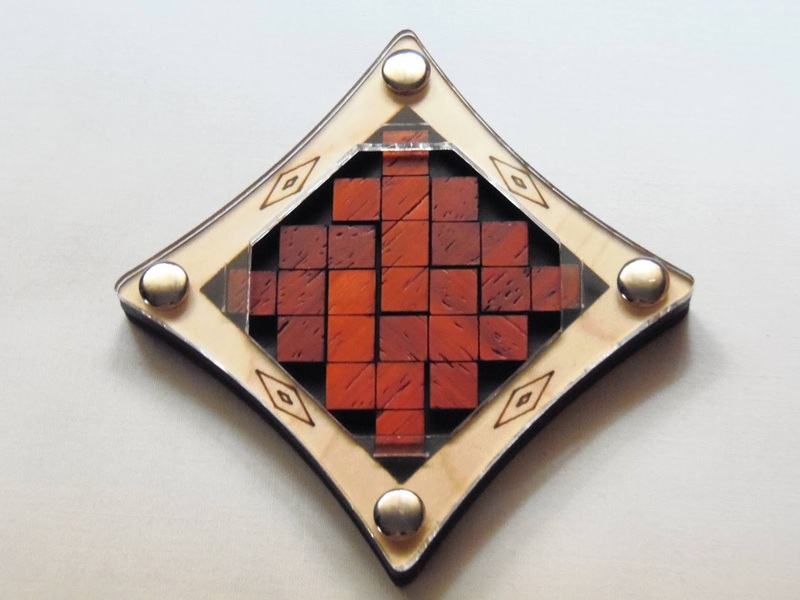 A great example of these improved designs is the Nagelbrett (German for Bed of Nails or Pin-Board), using 12 common pentomino pieces. 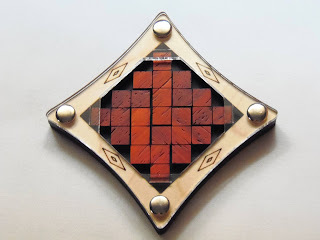 This otherwise ordinary puzzle would be quite easy if it weren't for the pins attached to the tray, which makes it exponentially harder than a regular pentomino puzzle. The puzzle, as any other Constantin design, is beautifully made in six types of wood and a deep red wooden tray. The result is this magnificent, visually stunning, colorful puzzle. With a diameter of 12.5cm (5"), it's also a pleasant object to handle - Not too big nor too small. 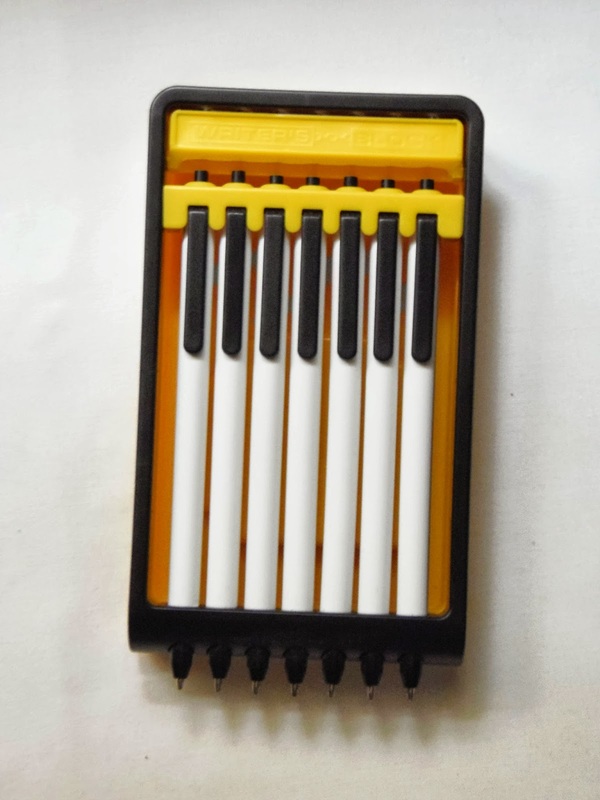 Each of the twelve pieces has a hole strategically placed to fit one and only one pin. When you have all the pieces correctly placed in the tray, it should have an empty square-shaped space in the middle. Now, I'm not entirely sure the empty space has to be a square, since it does not state anywhere that it should be that way. I'm just assuming that it should be this way, because it comes packaged in this form. Curiously enough, when I tried to solve the puzzle for the first time I wasn't able to pack the pieces in the correct way to show the empty space in the middle. Instead, I ended up with two empty spaces with the same area. After a careful observation, I easily corrected it by moving just two pieces. There should be other solutions as well with different empty spaces in other shapes, which is actually good for the puzzle's replay value. Solving the Nagelbrett can be a little tricky, especially if you don't have experience with packing puzzles. You should pay attention to where each hole is located in the pieces and try placing it in different positions. Fortunately, this is somehow intuitive and after some of the pieces are in place it gets progressively easier. Like I said, you could end up with a different shape or place for the empty space, but that's not exactly an incorrect solution. Just not that elegant like the original one. The Nagelbrett by Constantin is yet another perfect packing puzzle. It adds an original idea to a known concept combined with a beautiful presentation in several different woods. What else could you ask for? If you're a fan of packing puzzles, this one is a must-have. 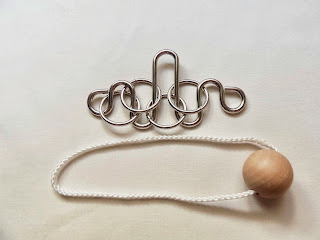 Availability: The Nagelbrett came from Brilliant Puzzles, but as of this writing it's out of stock. You can check out other puzzles from Constantin in the meantime. Check their site regularly for restock updates. 1 x 9 by Jean Claude Constantin is a fascinating little puzzle. There are a few reasons for this, and if you're a fan of packing puzzles you're in for a real treat. Let's start by its name, 1 x 9. It's as simple as that, you have 9 distinct pieces arranged in a 3 x 3 one-layer frame and your task is to remove all pieces and pack them again so that all of the tray's area is occupied without any empty spaces. This could easily describe a good portion of all packing puzzles out there, if we weren't talking about a Constantin puzzle, that is. 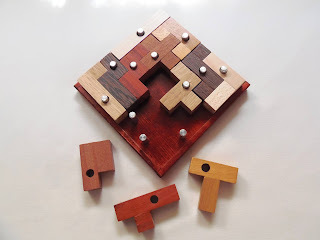 There are some characteristics, however, that make this puzzle quite unique and very original. One of the 1 x 9 unique features is its size. 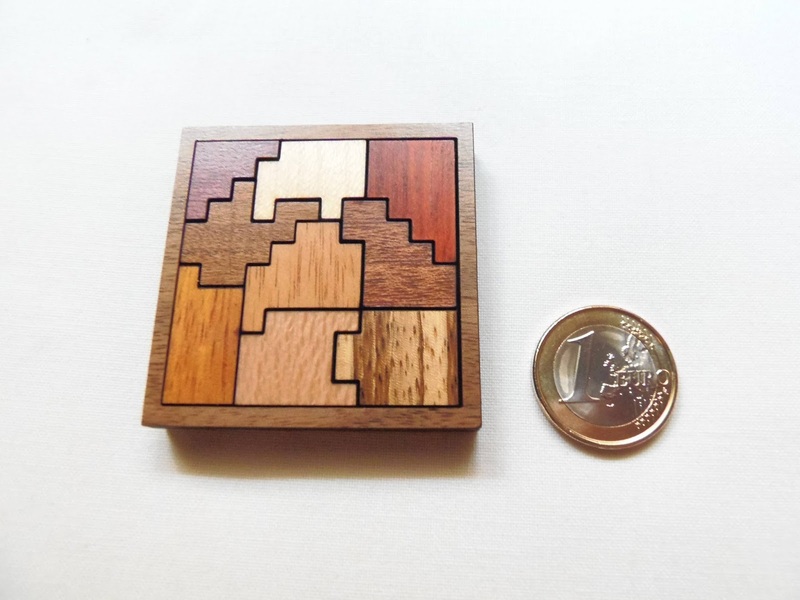 We're talking about a really tiny puzzle here, measuring only 5 x 5 x .8cm, which is about 1.97" x 1.97" x .31" (check out the photo below for a size comparison with an Euro coin). I believe this is the smallest packing puzzle in my collection so far. It fits in a wallet. How much more portable could it be? Despite its apparent smaller size, handling the puzzle feels natural and doesn't bother me a bit. 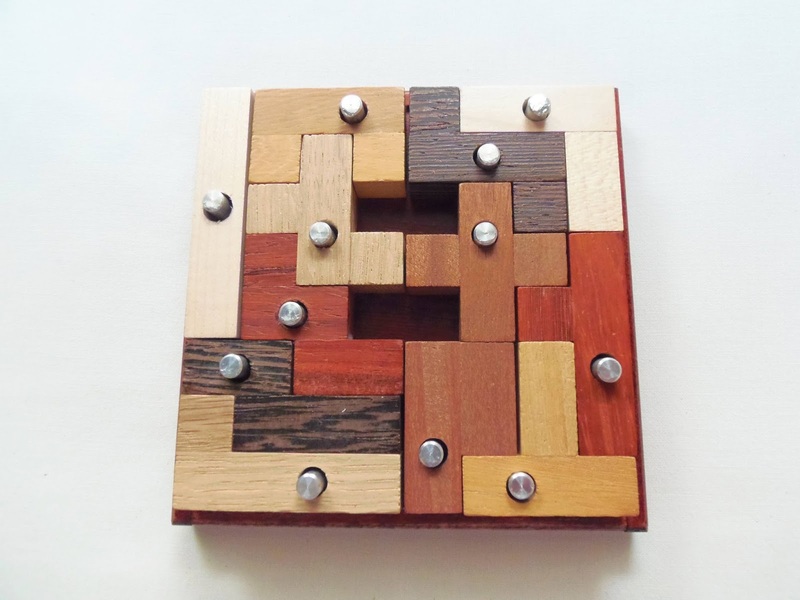 Another nice feature of the puzzle is the use of nine different wood types, one for each piece. This array of colors create a stunning pattern that captures the attention of anyone right away. That's quite a feat for a puzzle of this size. Each piece is carefully made from laser-cut wood and the surface is very smooth to the touch, very pleasant to handle. 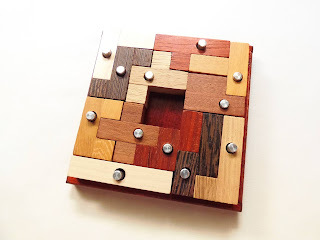 From what I can see, even the frame has been cut from a different wood, for a total of 10 different wood types - You don't see that everyday in a puzzle. In terms of difficulty, and looking at the shape of the pieces, you can already tell that it should be a little challenging. It's rated as a difficulty level 8/10, and after solving it in about 15 minutes or so, I'd say it's about right. There's a trick from solving Jigsaw puzzles you can apply here. If you take a closer look at the pieces, you'll see that some of them have two straight edges adjacent from one another in a 90º angle. There's actually more than four pieces with these characteristics, though, so it's not as simple as that, but it's a start and should help you in your task. Try to separate the pieces and keep alternating between those corner pieces. You can also use both sides of the pieces. Constantin could've stopped at the features mentioned above, but he outdone himself by creating 9 different versions of the puzzle using different shapes for the pieces. That's the reason why my puzzle is #2... Because there are 8 more and he needed to differentiate them from one another. If one puzzle is not enough for you, Constantin also thought of that by creating a unique version of the puzzle with all versions in one. It's called the 9 x 9, and it's rather intimidating, even for experienced puzzlers. I absolutely loved Constantin's 1 x 9 puzzle. The design looks so simple and yet, with all the special characteristics, he turned the puzzle into something extraordinary. I highly recommend this one, or should I say these 9 puzzles, to anyone who loves packing puzzles. You'll certainly love it just as much as I did. Availability: As of this moment, only 2 versions of the 1 x 9 puzzle are available at PuzzleMaster, #1 and #3. If you really want all nine versions you can purchase the 9 x 9 puzzle instead. It also adds another degree of difficulty.